Everyone knows that if you will visit Hong Kong, you should check also its nearby neighbor, Macau. As suggested, we also did that during our trip. I was surprised that both locations were very near yet they have different vibes. And to tell you honestly, Macau gave me a familiar feeling. As we all know, Macau was once a Portuguese territory which explains its Latin culture in their establishments, even in their transportation, they have Portuguese announcements which Hernan could understand (and I can’t). It was amazing how the history of the place reflected in the area which I think made it more unique to its neighbors. 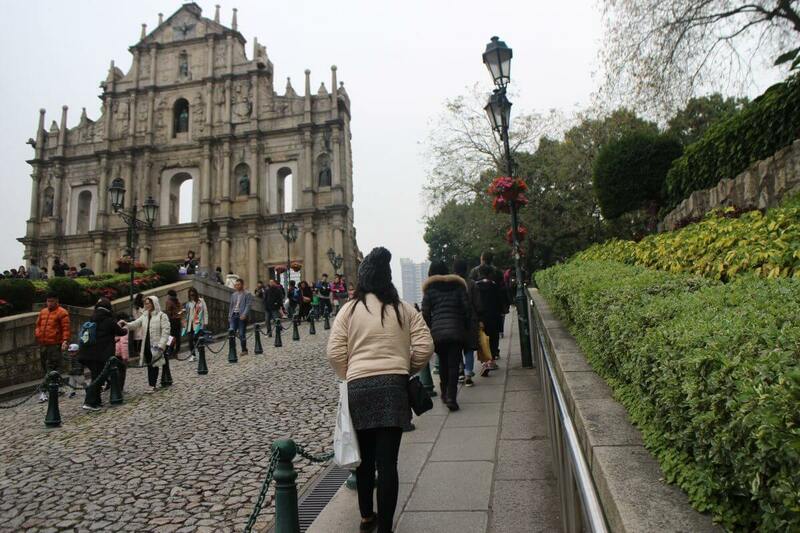 It was a pity that we only had one day to explore Macau, but that one day was a crazy adventure. We had a road trip until the Chinese Border. So, let me tell you how our day went. As we were on our way to the ferry, we bought our tickets just before 20 minutes of its departure. Since we didn’t want to waste our time waiting for the next one. We bought the tickets not knowing the long line of people going to the same location. The line was long enough to doubt ourselves if we made the right decision, or if we made the right choice of time departure. Some were asking if they can insert into the line because their departure time was just a few minutes away, and I’m about to do the same. It turned out we had the same time waiting to get to the immigration area. I’m not sure if I felt a relief after knowing that or more worried that we were all waiting for our turn to get to the boat for just a few minutes. Good thing was, we did get on board on time. From Hong Kong Macau Ferry Terminal (nearest MTR: Sheung Wan Station) going to Macau Outer Habour. You can buy the tickets online. Check Turbo Jet Website for more details. Also, don’t forget to use Google Maps‘ directions to navigate yourself in Macau. You can buy a simcard to have a data internet connection. Once we arrive to Macau Outer Harbour, we took some free guides and maps just before we went out and start our explorations. We took the bus going to Rua do Cunha and on our way, we saw Macau Tower from the bridge. Maybe we were too excited to get out and start exploring Macau that we did not managed to create a good and concrete plan on how we like to spend our day. Maybe, we were just too hungry? Hernan was too excited to go to a Portuguese restaurant in Rua do Cunha called O Santos – Comida Portuguesa Restaurant. To be honest, the food was so good! Hernan had a steak and I tried a bite and goodness, it was the time I realized how good Portuguese Steak really is. I ordered a wild pig which was also really good, it was suggested by a Filipina waitress working in the restaurant. The meals are quite expensive for me; it was around HKD 200.00 per meal. But, it was worth it! P.S. HKD is widely accepted in Macau. After we ate, we went out and tried to decide where to go. I took my phone and checked my draft of our itinerary. We had a little adult discussion if we should stay or explore the attractions near or should go to the other island. We decided to do the latter. And so, we went to Senado Square. There were many tourist in the location. The stores were on sale and we had a little shopping there. With my pocket money trying to keep up with me, I was hoping that a little shopping won’t hurt my budget but actually it did. In spite of this, I’m still happy with what I got. The Square was very captivating. It has very colorful establishments around which could be a very nice background minus the flock of tourist. Even with the people around, Senado Square was still beautiful. We walked along and we found St. Dominic’s Church. Not too far was the ruins of St. Paul. Tourist were everywhere! Some were sitting on the stairs and some were taking pictures. Just beside the ruins of St. Paul is the Monte Forte. We took some time to relax a little and just looking at out surroundings. The Park was beautiful. It has big trees and various flowers around. Macao Museum was also beside it, but we had a little time so we did not go there. Maybe next time. I’m pretty sure, we will visit again. Our time was so limited and I know I owe Macau another visit. We went back to Taipa Village. Visited the 5 old Taipa houses. They said that those used to be homes of Portuguese Families living in Macau. As we were walking, we saw an old man playing violin facing the lake. We can see the casinos from we were standing. The old man was very talented and he was playing some kind of classical music (I think) with a stunning view in front of him. We sat on the chair and enjoyed the beautiful sunset in from of us. Indeed, it was a beautiful afternoon. We got back at Rua do Cunha, we tried the Portuguese Tart. One of the must-tries in Macau. and gosh! It was delicious. We bought some sweets, it’s called almond cookies. We checked the famous casinos. It was so damn cold and we were just walking going to Venetian. As we got inside, the Venice inspired interiors was extremely beautiful. The famous canal is inside the establishment and you can even rent the gondola. However, for me, the small houses in the streets of Taipa Village was more interesting than these big casinos. It was so big that we got lost on our way back. We went inside to the nearby casinos and it was like a big maze for us. As we were walking inside in City of Dreams we saw some people running. There were people teaching us the direction. They said it was a show and we thought it was something for free. It was a world’s largest breathtaking water show; The House of Dancing Water! Unknowingly, we also run towards the venue without tickets. As we arrived, the ladies in front of the door asked for our tickets. And we had none. I was not embarrassed when they ask for it since I didn’t know what was inside. It was actually funny, we just smiled at them and said “we don’t have any tickets” then walked away. In case you wonder, the ticket cost starts at HKD 580.00 for adults. I know! So expensive. The night was so cold and we just walked and talked where we were going next. We got in from of Wynn Macau and Wynn Palace. I wanted to ride the cable car, I’m not even sure it was for free or only for the guest of the hotels. Instead, we waited outside for the Performance Lake. Celine Dion’s song played and the water starts to dance. It was good but the cold was killing me. The song stopped and we waited for a bus just to get out of the place. We were freezing. We took a bus, not even reading where it was headed. Thinking we will figure it out on our way. As the minutes went by, we were still on the bus, I think it was more than an hour. I checked my phone where we were currently at. And oh! We had a long road trip. We even got near the Chinese border where the last stop of the bus located. I’m pretty sure that China was just behind those walls, and we even joked saying “Hello Eva! We can see China!” Eva is my Chinese friend by the way; she is form Shanghai. We got to the last stop and took another bus going to Macau Outer Harbour. We went back to Hong Kong and that was the end of our Macau Adventure. I know you have similar experience in a place too. Share your crazy adventure in the comment box below!